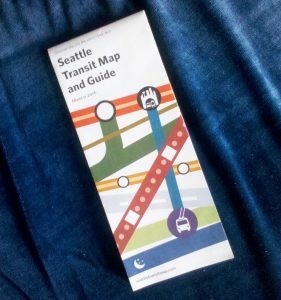 Seattle has long needed an easy-to-read and portable transit map. Now we finally have one! This map was created by Oran Viriyincy and produced by the Transit Riders Union in collaboration with the Seattle Department of Transportation (SDOT). It’s an invaluable tool for navigating Seattle’s increasingly integrated network of buses, light rail and streetcars. Line thickness and color intuitively emphasize high-frequency, all-day service. While app-based tools like One Bus Away and Trip Planner can show you the best way to get from A to B, the Seattle Transit Map allows you visualize the transit system throughout the entire city, so you can discover new connections and destinations. It gives you the freedom to travel through the city with confidence without planning every detail of your trip in advance. How can you get a copy, you ask? TRU has limited quantities available at our meetings and events – so check out the calendar and come on out! SDOT and Sound Transit may also have copies at their outreach events. You can also order a poster version directly from Oran. And, if you become a member of TRU or make a donation, we’ll be glad to mail you a map (or a few) as a thank-you.